Looking to solve an archeological mystery? Confirm historical theories? Make a BBC documentary? Just start digging the tunnels for a railway line in Europe-all the good secrets are buried on the most direct train routes. 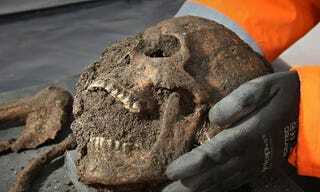 This week came news that digging for the Crossrail train line outside of the historic boundaries of the City of London unearthed the graves of Black Death victims from the Middle Ages. Scientists called in to analyze the skeletons took samples of bacteria from the teeth of the dead and finally put a logic puzzle that bothered countless school children to rest-Black Death was spread by breath, not flea. Infection was spread human to human, rather than by rat fleas that bit a sick person and then bit another victim. While we all learned that the devastation known as the plague, a bacterial infection (Yersinia pestis) that decimated the European population was a particular strain that was spread by fleas on rats, the incredible pace by which it jumped from victim to victim, especially in less densely populated rural areas pointed to a more direct method then random flea bite. Though plague may seem like some chapter in ancient history you learned about in junior high these days, in actuality it still pops up in various parts of the world. Periodic outbreaks seem to keep flaring up in Madagascar and in 2010 an outbreak in Peru counted 17 infected individuals. Lest you think it only happens in far flung exotic locals, in 2012, a man in Oregon trying to save his cat's life when it started choking on a mouse, was infected with a particularly tenacious version when the cat bite him. In fact, the US ranks 11th in the world in number of incidents of plague. Most of those come from squirrels and prairie dogs, which really makes me rethink all those times I tried to get squirrels to eat peanuts out of my hand. Hopefully the skeletons of the plague victims, who in addition to dying in a nasty way, were malnourished and had rickets, will find a new more permanent burial ground, one nowhere near a popular train route. And just for peace of mind, while we no longer market the plague vaccine in the US, high doses of antibiotics will cure it. Pepper The Robot Has All The Love You Will Ever Need. A Skin Suit Made of Skin Grafts?